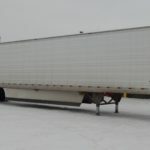 Containers - Kingpin Trailers LTD.
Side Walls 19 gauge (0.045″) thick galvanized steel sheets pre-painted white riveted to fabricated 19 gauge (0.045″ )thick galvanized steel pre-painted white modified hat sections located on 24″ centers. Roof Installed in three sections; center section is 0.040″ thick aluminum with two end roof panels of 0.050″ thick aluminum for extra strength and damage protection in these highly stressed areas. Roof bows are extruded aluminumanti-snag sections bonded to roof panels on 24″ centers. All roof bows are installed using four 1/4″ solid aluminum rivets, two per end, for maximum strength and protection against roof racking. All roof panels have full perimeter roof rivets located outside the cargo area for maximum water tight integrity. Front Wall Galvanized steel anti-snag hat section on 24″ centers. Pre-bonded to roof sheet. Roof bows installed using four solid rivets, two per end. Front Frame Four hi-tensile, hat shaped, posts securely fastened with 6 heavy-duty fasteners and reinforced with a special angle clip, welded to the upper coupler and coveredwith 0.050 aluminum front sheets. 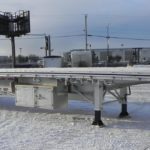 Tunnel Hot-dip galvanized, hi-tensile steel construction 3/16″ thick with low profile header, tube shaped posts. Forged steel angle irons in top corners for added rack resistance. Lights recessed in rear sill with heavy-duty protection bars. Stacking/Lifting Frame High tensile steel stacking/lifting postswith special hour glass design header sub assembly welded together to form a unitized structure with the front or rear frame to resist the high loadings and maintain its strength and rigidity. Header hour glass design provides a unique 16″ “Zone of Protection” around each upper handling fitting. Upper apertures are located at the 96-3/8″ wide top pick location with the lower fittings provided with both 89″ and 96-3/8″ aperture centers. Both upper and lower fittings incorporate special extensions that extend into the stacking/lifting posts and header to provide additional strength and reinforcement against racking loads. Rear Frame High tensile steel stacking/lifting posts with special hour glass design header subassembly welded together to form a unitized structure. Rear corner posts are two piece sections which incorporate full height hinge protection. Rear header has integral water drain trough and provision for full external roof riveting. Rear frame has corner reinforcements to minimize racking. Door opening is 100″ wide by 109-1/2″ high. 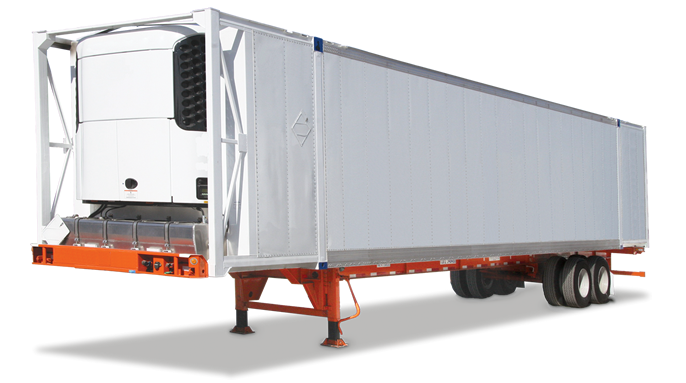 Rear Doors 1/2″ Nominal thickness composite panels featuring high strength galvanized steel facings. Outer facing is pre-painted white. Perimeter of each door is fitted with dual durometer door seals, two locking bars, and five hinges. Crossmembers 2-1/4″ Deep fabricated “I beams of super high tensile steel located on 10” centers. Floors 1-1/8″ thick laminated hardwood attached to crossmembers using three 5/16″ diameter screws per board per crossmember. Floor screws installed in staggered pattern to ensure crossmember stability and resistance to roll. Lining None on side; 3/8″ thick exterior grade plywood on frontwall. Logistics Optional series “A” type logistics slots can be provided at side post locations. Paint All steel parts are abrasive blasted and coatedwith a zinc rich epoxy primer. All exposed steel is top coated with awhite polyurethane paint. Undercoating Underside of floor pre-coatedwith a special sealer and crossmembers dipcoated with a black color rust preventative. Markings Customer marking can be applied.